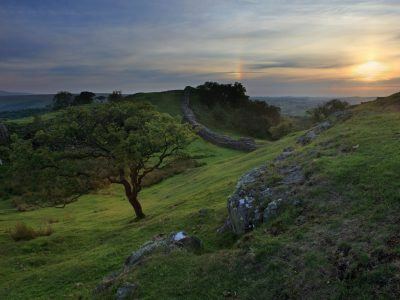 Steeped in prehistoric hill forts and Roman ruins, rugged castles and defiant bastles, Northumberland National Park is bursting with history. Many historic sites are free to enter, allowing you to soak up the atmosphere in your own time. Explore our historic sites around the Park. The surviving base of a rare, early 19th century corn-drying kiln; in a picturesque location alongside the River Coquet. The drying of oats and barley prior to milling was once essential in this wet upland environment. A 19th century Roman Catholic chapel built on the base of a medieval tower. It is in a secluded woodland setting on the southern edge of the Cheviot Hills between Alwinton and Netherton. Access is to the exterior only from public right of way or permissive path along woodland track, signed from a minor road. Location: Just west of Biddlestone hamlet, off a minor road. OS Grid Ref. NT 956 083. 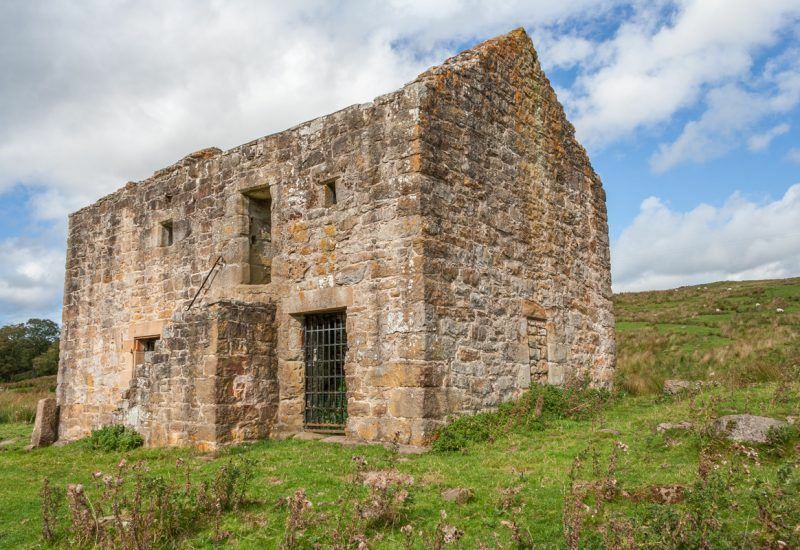 A chance to discover a ruined fortified farmhouse known as a bastle. 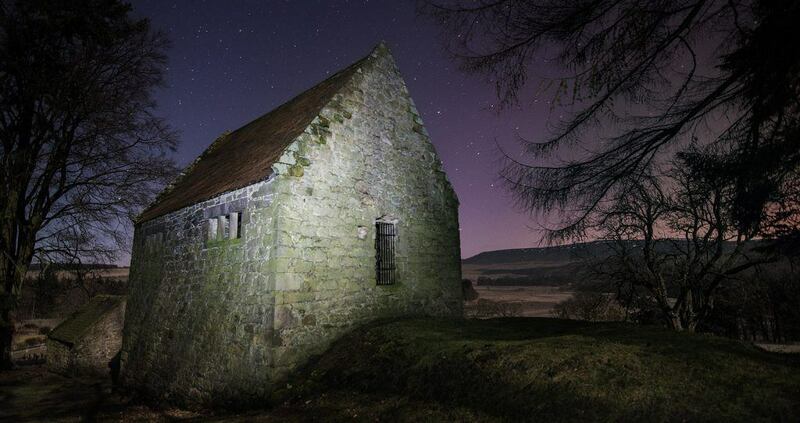 It was attacked in 1583 by the notorious Armstrong family, well-known Border Reivers. For more, click here. Location: The bastle house is about 180 metres north of a minor road, 7 miles north-west of Bellingham; or along a minor road from A68. OS Grid Ref. NY 773 900. A Victorian timber cabin, originally one of 47, used to house workmen and families during the construction of Catcleugh Reservoir (1891 – 1905). Location: Situated in private woodland, adjacent to the A68 and 4.5 miles/7km south east of the Scottish Border near Carter Bar. OS Grid Ref. NT 751 032. A 19th century limekiln. Limekilns were once common, supplying burnt lime to local farmers and builders. There is access to the front of the kiln only. Location: The limekiln is situated on a minor road, signed to Bardon Mill, off the B6318 between Housesteads and Once Brewed. There are two parking spaces in the layby adjacent to the kiln. OS Grid Ref. NY 781 670. The grass-covered lower walls are all that remain of Dally Castle, a medieval hall adjacent to Chirdon Burn. 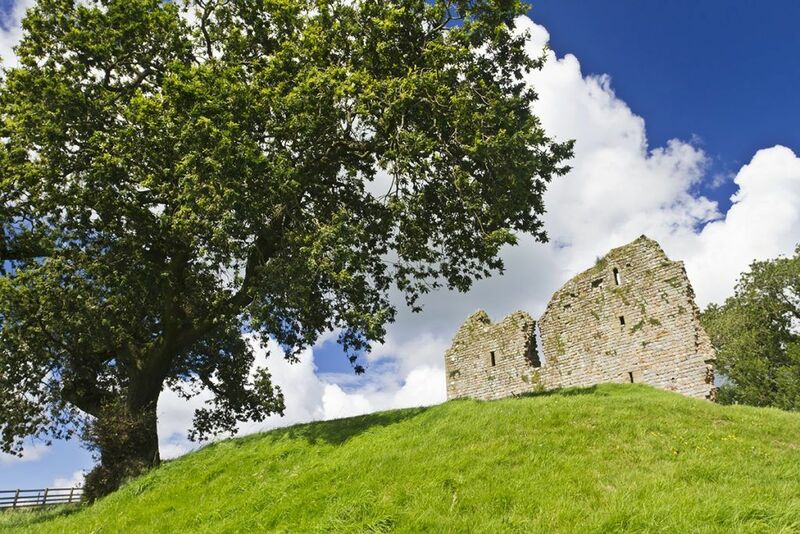 The quality of the surviving masonry suggests it was once an impressive family stronghold. 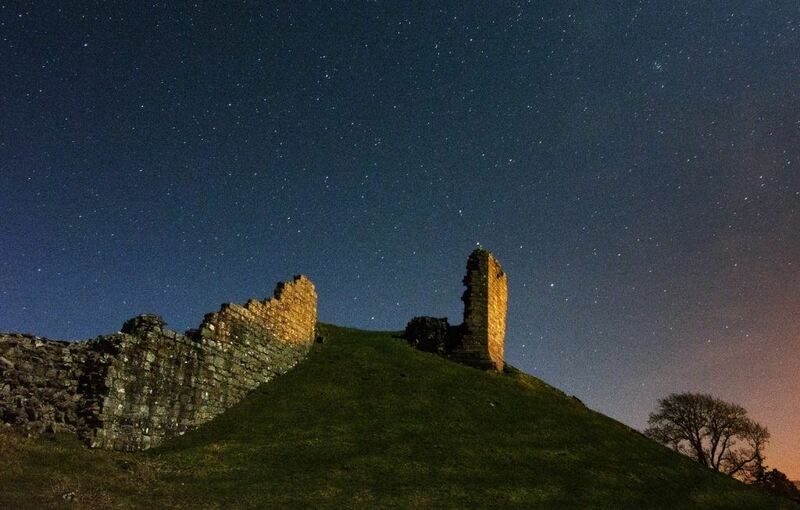 Location: Dally Castle is 1.5 miles/2km south west of Tarset. It is a 30-metre walk from a roadside layby on a No Through Road to Chirdon. There are two parking spaces in the layby. OS Grid Ref. NY 775 844. Elsdon. Free (access confined to area immediately inside entrance gates of this private residence). 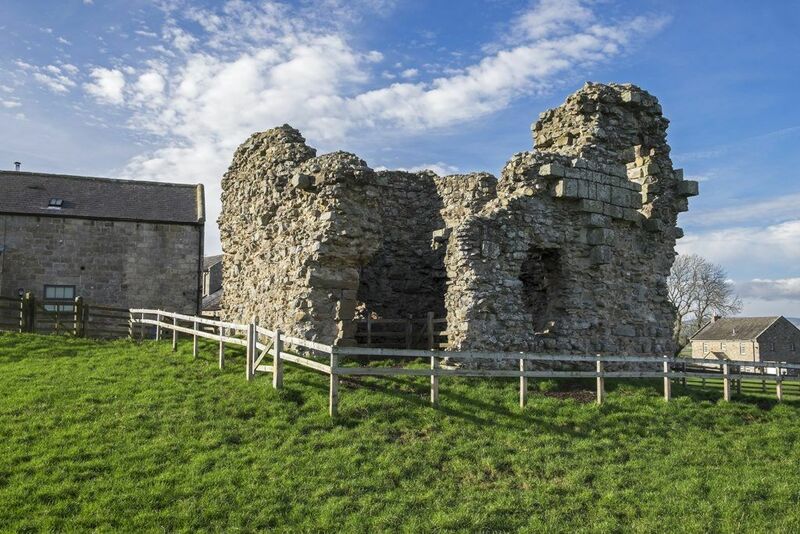 An impressive, fortified medieval tower-house, often known as the ‘Vicar’s Pele’. It was extensively restored in 1995 and is the oldest, continuously inhabited property in the National Park. Location: It is situated on the northern edge of Elsdon village green, where there are parking spaces. OS Grid Ref. NY 936 934. The spectacular ruins of a 12th century castle commissioned by King Henry II to help defend against attacks from the Scots. It was built by Odinel de Umfraville in 1157 and saw plenty of action in its first few centuries, including falling into the hands of Robert the Bruce’s army in 1318. In 1515, it was the birth place of Margaret Lennox, grandmother of James VI of Scotland (later James I of England) and cousin of Henry VIII. Location: Access from Harbottle Castle car park 0.1 miles/o.2km west of Harbottle; walk of 0.2km to castle, with additional permissive access to the River Coquet. OS Grid Ref. NT 933 048. A curious small pool rumoured to be where the Anglo Saxon Saint Ninian baptised many early Christians. A stone cross placed in its centre by the Victorians adds to its sense of mystery. Location: Lady’s Well is a short walk north-west of Holystone. OS Grid Ref. NT 951 026. Visit for: Spectacular kiln that was built about 1827 to supply lime to the Biddlestone estate, but closed in 1866 due to high operating costs and competition. 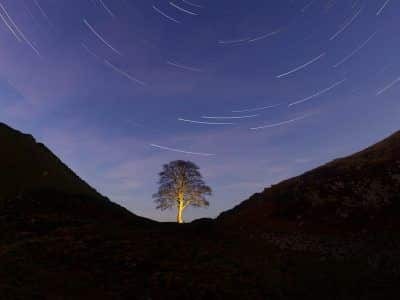 Restoration work has been carried out by Northumberland National Park Authority. Location: Walk of 0.2 mile/0.4km along public bridleway signed ‘Park House and Harbottle’. Parking in layby adjacent to St Michael’s Church, Low Alwinton. OS Grid Ref. NT 925 056. 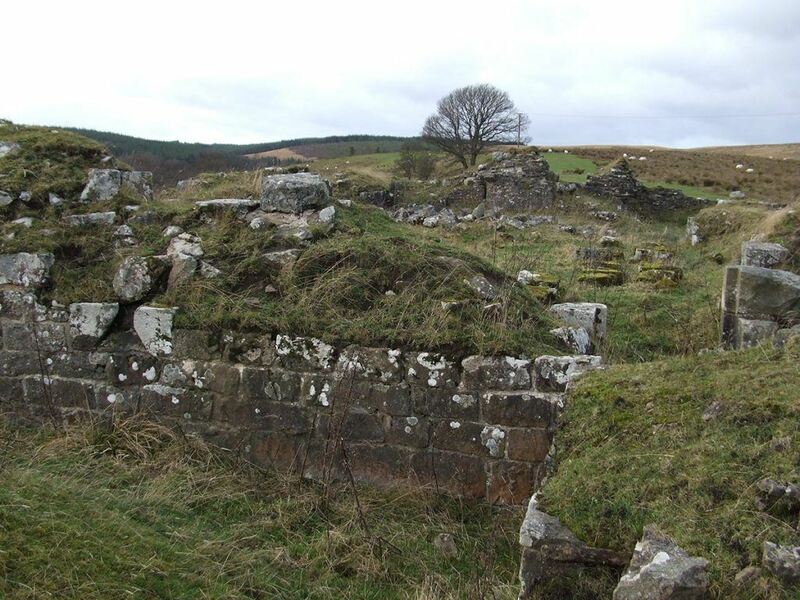 The solitary ruins of an early 17th century ‘bastle’ or defensible farmhouse, typical of the ‘Border Reiver’ period when local families stole each other’s property and livestock. Location: There is a 0.3 mile/0.6km uphill walk to the bastle from a car park on the north side of the road 1.25km west of West Woodburn. OS Grid Ref. NY 878 868. An attractive example of a dovecote dating from 1743. The dovecote is situated on the edge of Sidwood Forest and would have formed part of the walled gardens of Redheugh Farm. Doves and pigeons were reared for meat, eggs and fertiliser for the garden. The dovecote also contained a fireplace and flue for heating tender plants on an adjoining wall. Location: There is 50-metre permissive access from the Greenhaugh to Sidwoood Road at Redheugh, north west of Greenhaugh. There are two car parking spaces in a small clearing in Sidwood Forest. OS Grid Ref. NY 784 884. The ruins of a stronghold built in the 1330s by John Thirlwall, that provided protection for his family and descendants for the next 300 years. Several generations of Thirlwalls survived attacks by Border Reivers and prospered. The castle estate was sold to the Earl of Carlisle in 1748 for £4,000. Location: Walk along public footpaths to the castle from Greenhead (0.4miles/0.7km) or Walltown Country Park (0.6 miles/1km). OS Grid Ref. NY 659 662. An extremely well-preserved example of a rural limekiln, built in 1888 for Lord Armstrong’s Cragside Estate. Location: It is situated on a quiet country lane 0.3 mile/0.5km north west of the village of Tosson. There is access from a car park on the south side of the kiln. OS Grid Ref. NU 028 010. The ruins of a 15th century tower-house. Most of its quality masonry has disappeared, but it still manages to convey a sense of strength and security. It was a place of refuge during the Anglo-Scottish wars. Location: It is situated on farmland in the small village of Tosson. There is access from a car park at Tosson Tower Farm with a 50-metre permissive path leading across a field to the tower. OS Grid Ref. NU 029 005. Near Holystone. Free.Guided tours inside. Seeing for yourself the evidence of Northumberland’s violent past in this ruined fortified farmhouse. Owners would take refuge from the raids from the Border Reivers and soldiers, housing livestock on the lower floor and living above them. With walls one-and-a-half metres thick and a stone spout to pour molten lead on enemies, it was an imposing target for would-be raiders. Location: In the beautiful parkland of Holystone Grange. Access from car park, a permissive path of approximately 0.1 miles/0.2km. Postcode: NE65 7AN. OS Grid Ref NT 966 003. The rich history of our Park is soaked in the arts and music. An iconic landmark of Roman Britain. Tick these amazing landmarks off your bucket list.